There is little question that perennial boys soccer powers and defending Class 3A regional champions Naperville North and Lyons will be strong again this season. Both teams, however, still will be searching for answers when the teams meet at 6:30 p.m. Thursday (Aug. 28) in Naperville. Naperville North tied last season’s early-season contest with Lyons with 16:57 left, resulting in a 2-2 draw Aug. 29 in La Grange. The Huskies won the 2012 matchup 4-1. Jim Konrad returns as Naperville North’s head coach after stepping down last year to serve as the school’s athletic director. With current varsity assistant Steve Goletz as head coach, the Huskies were 12-7-2 in 2013 and captured their seventh regional in eight seasons before losing to Waubonsie Valley 2-1 in the Metea Valley Sectional semifinals. 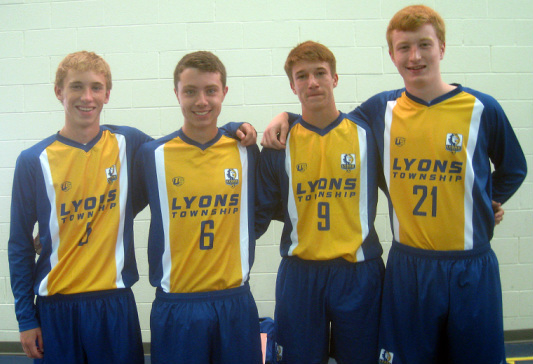 Lyons is scheduled to begin the season Monday against Whitney Young in La Grange. A tough home match against Neuqua Valley is scheduled for Saturday. Naperville North is scheduled to open Tuesday at home with Oswego East. The Huskies have five returning starters in seniors Christian Robert (goalie), Chris Ensign (forward), Brandon Hipp (defense) and Wesley Wong (defense), junior Grant Borg (midfield) and sophomore Chris Sullivan (midfield). Robert, Ensign, Hipp and Wong are team captains. Ensign earned All-DuPage Valley Conference honors in 2013 and Borg received All-DVC honorable mention. This is the third varsity season for each. “(Ensign’s) athleticism will make him dangerous up top. (Borg) will have to be a dominating presence in the midfield for the Huskies to control games,” Konrad said. The Lions have four returning starters in seniors Patrick Duncan (forward/midfield), Leo Gabrek (midfield/defense), Cole Gilchrist (forward) and Harry Hilling (midfield). Although the Lions graduated all five of their 2013 All-West Suburban Conference Silver players, center midfielder Hilling was an integral part to the team’s success. The Lions finished 17-3-3 and won 10 straight before losing to Morton 1-0 in the Hinsdale South Sectional final. “He was one of our best players last year, and I expect him to be one of the best players in the state,” Labbato said. A new contributor at forward/midfield will be 6-foot-1 sophomore Paul Fulop. Also returning for Naperville North are senior Carl Zaba (forward) and junior Martin Li (midfield). Key newcomers are senior Mattie Sylvester (defense) and juniors Adonay Hammond (forward), Kevin Keane (defense) and Jack Parsons (forward). While the Huskies probably will need Ensign and Sullivan to boost an inexperienced offense, they have worked to establish a solid defense. By contrast, the Lions are trying to construct a formidable defense after graduating all four starters and their goalie. Senior cousins Danny Thomas and Grant Thomas will play in the flat-back formation. Labbato said three goalies will get a chance to compete for the starting job – junior Donald Darrus, sophomore Gabriel Drobny and freshman Matt Vear. Gabrek, a defensive center midfielder, could join the defense after playing central defense with his club team.